Now cook the perfect rice, biryani and a large assortment of tasty and nutritious dishes with the Arise Rice Cooker 2.8 Ltr CFXB60-3A Rice Cooker. The cooker is perfect for your kitchen to cook some delicious food quickly and effortlessly. The Arise Rice Cooker 2.8 Ltr CFXB60-3ARice Cooker has a One Touch Function which lets you operate the appliance with just the push of a button. The Cook and Keep Warm Function both cooks the perfect rice while keeping it warm for you too. The Auto Shut Off function automatically shuts off the cooker when your rice is cooked or warmed. 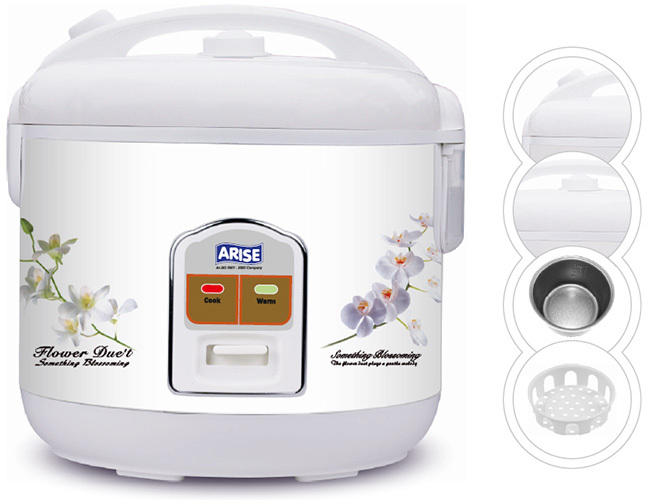 The Arise Rice Cooker 2.8 Ltr CFXB60-3A Rice Cooker has a non-stick coated inner container so that the cooked rice does not stick to the cooker. The detachable power cord makes storage and transportation of the rice cooker easy and hassle free. The Arise Rice Cooker 2.8 Ltr CFXB60-3Ahas a world class finish with elegant styling to add some class to your kitchen too. The rice cooker has a maximum capacity of 2.8 litres to let you cook for your entire family at one go. It consumes just 1000 watts of power to ensure maximum energy efficiency.